Salvi, Schostok & Pritchard, P.C. 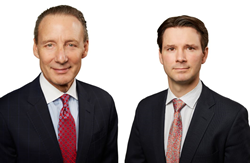 is pleased to announce Chairman and Managing Equity Partner Patrick A. Salvi and Chicago Managing Partner Patrick A. Salvi II have been selected to The 2019 Lawdragon 500 Leading Lawyers in America for the third straight year. Each year, Lawdragon selects their list of 500 Leading Lawyers in America through a meticulous process that includes editorial research by Lawdragon staff, submissions from law firms, and an online nomination form that allows visitors to recommend and comment on their favorite attorneys. Patrick A. Salvi and Patrick A. Salvi II concentrate their legal practice in cases concerning serious personal injury, medical malpractice and wrongful death. For more information, please contact Marcie Mangan at (312) 372-1227 or mmangan(at)salvilaw.com.